Will Ken Jeong's Daughter Zooey Be On Dr. Ken Again? Famous In Korea? How Do You Go From Being a Doctor to Being an Actor? Ken got the chance to meet some of Dr. Oz’s medical interns backstage and explained that recently, he, his wife, and a friend (who is a medical consultant on the show), got to explore more unique, “med-school kind-of cases” like Hypercalcimia mimicking depression. Dr. Oz was curious about the interaction between comedy and medicine because Ken was a great physician before he became an actor. Ken feels like his TV show is a 24/7 job and joked about being on “creative call.” Another parallel between media and medicine is the stamina required to work all of the hours needed. Dr. Oz agreed and said that another similarity is that in both careers, he has practiced both honesty and intensity. 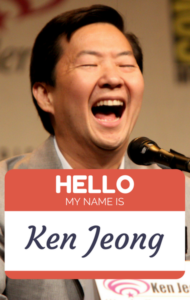 Is Ken Jeong Famous & Loved In Korea? Don’t take offense, no one knows you here… No one likes you. Do you love Ken Jeong? Do you wish that his daughter, Zooey, would appear on another episode of Dr. Ken? Leave a comment below to let us know!